It’s Thursday and round number one of severe weather has moved on. It will be interesting to see if there are any damage surveys done today regarding last night’s winds and potential tornadoes. There may have been one or two brief touchdowns within in the KC Metro area on the south side especially. Last night, as I wrote about in the afternoon blog update, was a night of leading edge to the line “spin-ups”. The “weather word” for the night was “mesovorticy”. Tiny little areas of rotation on the leading edge of a long line of storms. Small little couplets in the radar wind data that indicate rotation. Whether or not your community was struck…they do indicate areas of stronger winds sometimes as well so as Karli and I illustrated last night…they can do damage. In the end whether your community was struck by 50-80 MPH winds or a 50-80 mph tornado…damage is damage. Today: Variable clouds and muggy. Storm risks increase later this afternoon. The METRO may see scattered storms, although the severe weather set-up isn’t as high as it was last night. Tonight: Storm risks will increase. 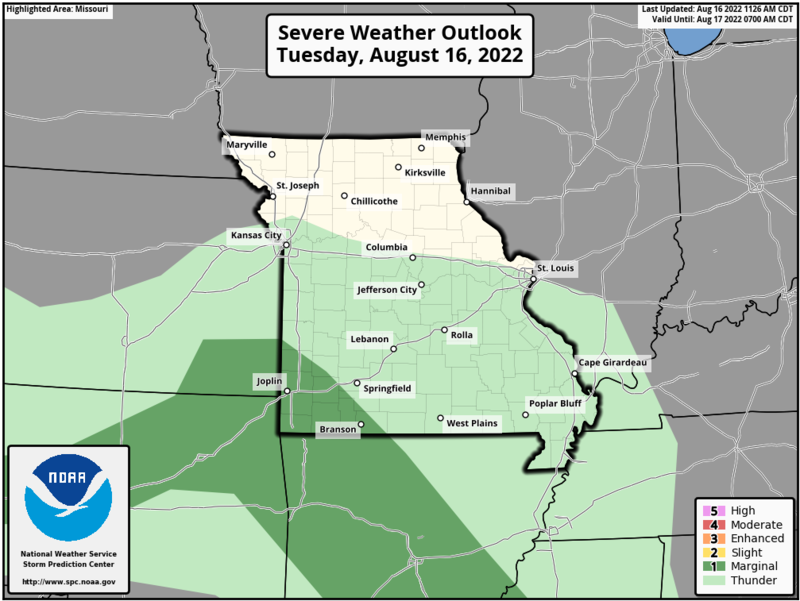 There is some question about coverage of storms and how widespread the KC Metro will get into…but from KC and northwards (especially) let’s watch for storms this evening. For areas south of the KC area…your timing may be after 11PM or so. All risks of severe weather will be there…with again hail and gusty winds being the main threat. An isolated tornado is possible especially in N MO. Flooding threat is reduced tonight. 100s of thousands of you heard the sirens last night. Some of it was justified, there were some communication issues for areas north of the MO River especially in the KC area and in reality there were no tornado warnings for the north side of KC proper. Other areas though were fighting strong winds. Most of the reports were in the 50-70 mph range. There may have been a couple of touchdowns as well. There were brief and short-lived but I’ll be curious about the circulations in southern JOCO KS that moved into MO. There were a few other areas of damage as well…also up towards Big Lake in northern MO where some boats got tossed around too. The rain was heavy some some localized flooding. Nothing too overwhelming though thanks to the speed that things were moving. There were some 6″/hour rain rates BUT since everything kept moving those rates didn’t stay in one place for too long. 1/4-1 1/4″ totals are common in the KC Metro it appears. Today there is more rain out there early this morning. We’re watching an area towards the south as daybreak falls. Let’s see how that develops and moves northeast into the area. Again for the kids have rain gear today. They WILL get the game in I believe this afternoon. Our morning weather map shows our stationary front…still stuck in place BUT today (later) it will be on the move and when it finally passes through the area tonight…that will end our risks of storms and severe weather. The SPC has placed this area under a slight risk of severe storms. Once the front sweeps through the cooler and drier air will flow into the area. As we set up for today…it will be marked by decent to muggy dew points…instability with surface temperatures near 80° and the main upper level system that’s been camped in the SW part of the country lifting towards the Plains. All coming together later today with the severe storm potential. Here is the HRRR model to get you through the day. It appears the main timing of the storms in the KC region would be again towards the mid evening hours. Wind/hail seem to be the primary threats from the storms. Coverage of them may not be as widespread as last night either. MOST of the viewing area saw needed rain last night…tonight the activity may be more scattered in nature. Let’s see how the late afternoon unfolds. More in a blog update later…but I need to get out to School day now! Thank you Joe ! Wish fox4 would show you and team doing your school day demonstrations. Will it be taped to view online ? The HRRR is always appreciated too.